This is an enchanting fairy tale; if only it were true. Reduce the size of the federal bureaucracy to free the economy from restraint. Reallocate bank bailout program funding to cut the national debt. Require new safeguards against raising taxes. Pass a presidential line-item veto. Pass a constitutional amendment requiring a balanced budget. Freeze discretionary spending at 2008 levels. Social Security, Medicare and Medicaid are going broke and will bankrupt our country. These views are prevalent among Republicans and are shared by Tom Reed. They can be summarized as: “government, taxes, regulations, and non-military spending are bad; a balanced federal budget is good.” Such views are simplistic at best. This entry was posted in 2016, Congress, Economics, Political, Reed's Views, Seniors and tagged Marco Rubio. Bookmark the permalink. I suggest another law. Deport all people of any generation whose ancestors were illegal aliens…Good bye , Mark. 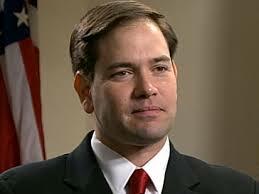 Rubio was one of the gang of eight who managed to get an immigration reform bill passed by the Senate. They always start out so well… you start reading, and think to yourself: “yes, yes, uh huh..” then you get two thirds through and realize, the ‘American Dream’ is synonymous with corporate empire, and the ‘livable wage’ mentioned in the beginning is simply trickle down slave wages. It seems to me too many of the politicians in Washington – Marco Rubio and Tom Reed to name two – continuously use their parents achievements as examples for us all to run from emulating. Their parents did everything right: they worked hard, they sacrificed, they held true to their morals, and priorities to give their kids a leg up to achieve. Poor little kids “making it in the big unfair world”. Yet it seems, the honor due their parents’ struggles, is in fact utterly dishonored – both by being used as though they themselves did that work, not their parents, and, the resulting selfishness inherent in the policies Rubio and Reed seek to mete out to their fellow Americans. And their parents and the congressmen received help from “big government”. Free education, Social Security, Medicare, etc. Our parents lived in a time of relatively high wages. Families today struggle to maintain their parents life style with more than one wage earner, multiple jobs, and consumer debt.